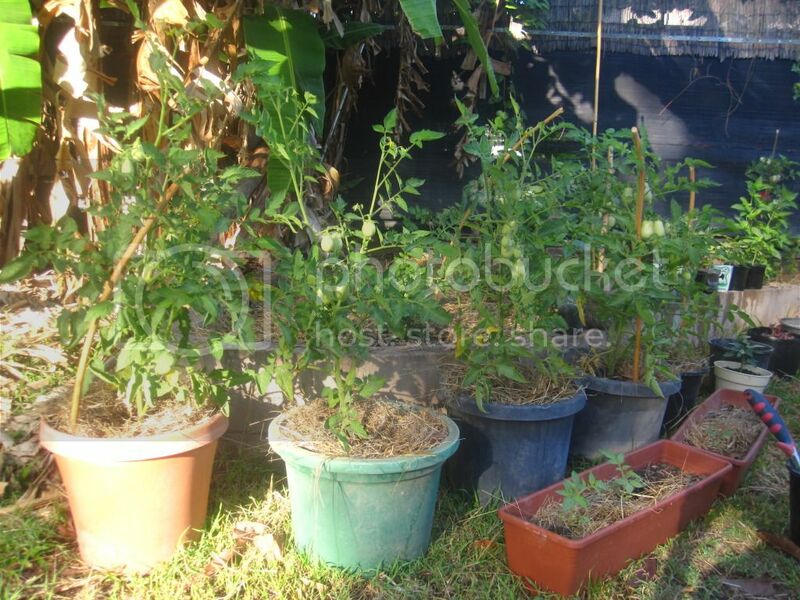 should I transplant my tomato plants into bigger pots? I've got some tomato plants in containers and now I'm starting to think they might not grow bigger because the pots are too small, so I've bought bigger containers. The current pots are about 25 to 30 cm. of diametre and 23 to 25 cm tall. The plants are between 23 and 25 cm high. So I don't know if the pots are big enough or not. The new pots I bought are 38 cm high and 65 cm of diametre, which I think it would be big enough. Roma is a paste tomato looks like a big plum! They will stay firm for a long time even when they lay on the ground! When you repot them put a few inches of dirt at the bottom of the container before you place the potted plant in the bigger container. Also add several inches above the top of the plant so itforms new roots at the top and bottom! I would also put a half inch of sand or a few stones at the bottom of the new container. Good luck! Re: should I transplant my tomato plants into bigger pots? Roma's are determinate type tomatoes (bear most of their fruit all at once and then are done) and as such don't get as big as indeterminates, but still it should get to be 4' tall and bushy. They are big plants and need plenty of room and soil. I'm having a bit of trouble converting centimeters to volume. We generally say that tomatoes need at least a 5 gallon (= about 19 litres) pot. If yours is significantly smaller than that, then yes, I would transplant it. As Bobber said, bury it deeper in the new pot than it was. It will root all along the buried stem, so you will have given it a better root system. Incidentally the VF stands for Verticillium/ Fusarium, two different wilt diseases that tomatoes are prone to. It means your plant has been bred to be resistant to them. Don't know on what basis you decided your plants are blighted, but if you are right, that is serious. Frankly, you've got guts to transplant! I too have a plant I would like to transplant but no way at this stage. Don't think it would be a happy camper. Good luck! Keep us posted. Try not to disturb the roots too much. if done carefully it can shock the roots into a more productive state (trying to survive) making it even more hardy. Not too mention with more room for roots to grow the plant will expand, they will grow to their surroundings. Kind of like at the end of the season when frost is coming. You can stick a shovel in around the root area this shocks the plant into ripening fruit. It wants to make seed before it dies. When starting seeds myself every time I pot up it explodes with growth. Thanks for the tip. My growing season, zone 5b can come to a very quick halt. I didn't know that about shocking the tomato... Interesting. I still would not transplant mine out of sheer fear of killing it at this stage of the game. but that's me! I might chance it if I had a longer growing season. They are actually pretty hard to kill. If you are too rough with it, it might drop the fruit that are currently on it, but then it would make more once it settled in. If you are gentle (i.e. dig it up with plenty of rootball so you aren't cutting many roots/root hairs) and the circumstances you move it to are about the same as where it was (soil type, sun exposure, etc), it will barely notice that it got moved. tomatoes are acutally perennial but in the US they don't make it past frost, in a more desirable climate they will continue to grow, though fruit production MAY be diminished. I know tomatoes are perennials, but what does that mean for determinate type tomatoes, such as the Roma? Does that mean it produces a crop of tomatoes and then does nothing til next year? To me it wouldn't be worth tending it all year for that, I'd just as soon start a new one over in the spring. The only point for me in tending a tomato plant all year would be if it would keep producing. Tomatoes, determinant or indeterminant, have a season and are perennial. 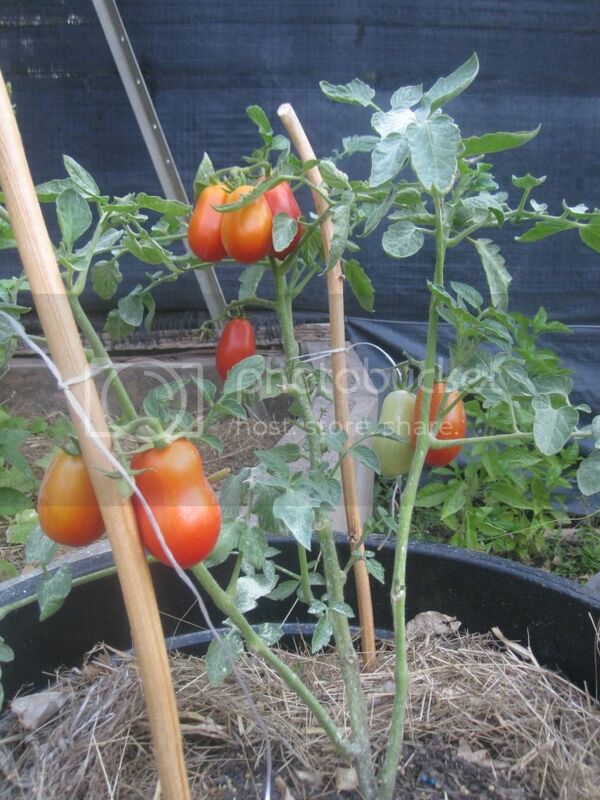 A determinant tomato will grow to a certain size and produce a certain number of fruit. They don't need pruning, unlike the indeterminant variety which will continue to produce suckers and keep growing. I believe that even in a tropical region, tomatoes would have a life span and you would have to start new ones from seed or buy new seedlings. Just guessing on that one, seeing as I don't live in a tropical region! So i transplanted the tomato plants and they are doing fine. The fist one I transplanted is actually looking so much better, it has given me more tomatoes ever since! Here some photos. 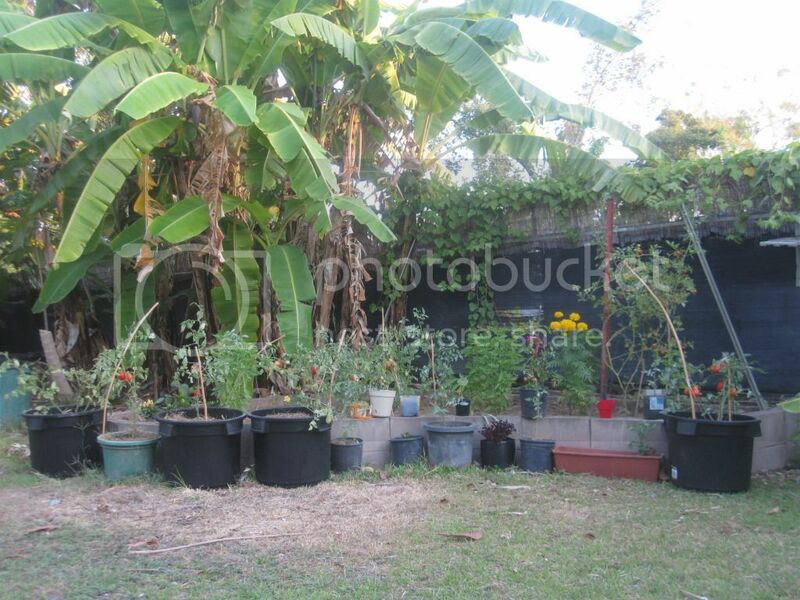 This is the veggie patch, in the back containers I've got the tomato plants that I transplanted. This is the first plant I transplanted; the photo is from one week ago. rainbowgardener wrote: Amazing that your tomato plants are giving so much fruit while still so small! By the way, bad news.... Two of the transplants are dying can i stop them from dying or are they in a point of no return? Can I transplant tomatoes to pots of garden dirt? Should I Transplant Tomato Seedlings?